Expedition to Egypt. April 2018. Naqada. Layer Step Pyramid of Nubt. The pyramid was probably the oldest work that we examined. it seems as if it belonged to the premetallic age. there are many questions still to be answered, dates and functions to be investigated. El-Kab. Rock-cut tombs of Nekheb. Rock-cut tombs, carved in the slope of the sandstone hill, are located in 450 meters to the north-east of the enclosure walls of the ancient city of Nekheb. Among more than 300 ancient burials, discovered there, only some of them have inscriptions and bas-reliefs. Among the identified ones there are tombs of such historical persons of the New Kingdom as the High Priests and Nomarhs of Nekhen Renini and Setau, the valiant naval officer Ahmose (the son of Abana) and the Nomarch of Esna and El-Kab Pahery. Joint Russian-American research project. "The mysteriuos Paracas of Peru: beyond the Black Sea"
"THE MYSTERIUOS PARACAS OF PERU: BEYOND THE BLACK SEA" HAS STARTED! Elongated Skulls From Ancient Russia And Black Sea Areas. 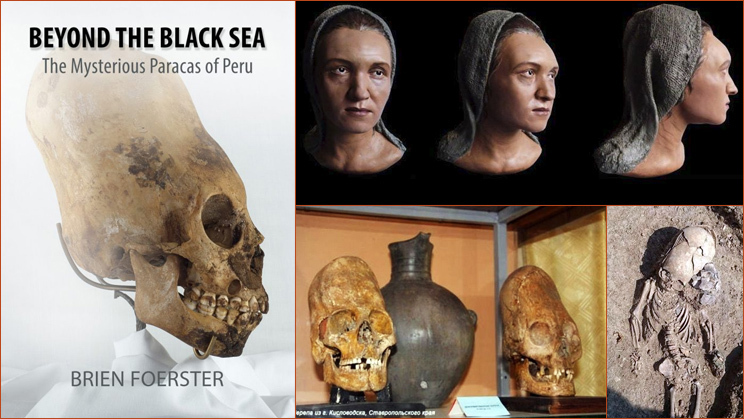 "As of April 2018 I am in correspondence with a number of researchers in Russia who hopefully will be able to get me more information about the elongated skulls found in the Black Sea and related areas over the course of time. This may take weeks or months to obtain, and thus may not appear in this book, but in a later update most likely. For now, let us see what and where anomalous skulls have been found." The joint expedition of "ISIDA Project" and "Anthropogenesis" has arrived with new material and more new information for the future stadies. The first starting point on the Map of Egypt is the ancient city of Nekheb. "it is the only city of remote antiquity the walls of which still stand almost intact. whose soldiery once manned the now silent walls." The creative Director of ISIDA Project, poet, musician and photogrepher made a very unique polygraphic work. In this project he compared pictures, engravings, old photographs of ancient Egyptian monuments and landscapes with their modern photographs, which he made by himself. He made more than a hundred comparisons and chose the best. The project is still in progress and it is quite unique. It will be interesting to look at how it was seen a long time ago and how it looks now. Below are some examples. For purchasing a full-version printed volume, please contact the author and the creator of the photo-album Valery Senmuth. The Subsidiary Pyramid at Meidum. ISIDA Project announces another article "The Subsidiary Pyramid at Meidum, is it a 60 degree pyramid?" , written by the independent researcher Keith Hamilton, based on the materials of the first and modern researchers, as well as on the information, gathered during the expeditions of the ISIDA Project. ISIDA Project announces another article "Mastsba el-Fara'un", written by the independent researcher Keith Hamilton, based on the materials of the first researchers of the Mastaba, as well as on the information, gathered during the expeditions of the ISIDA Project. 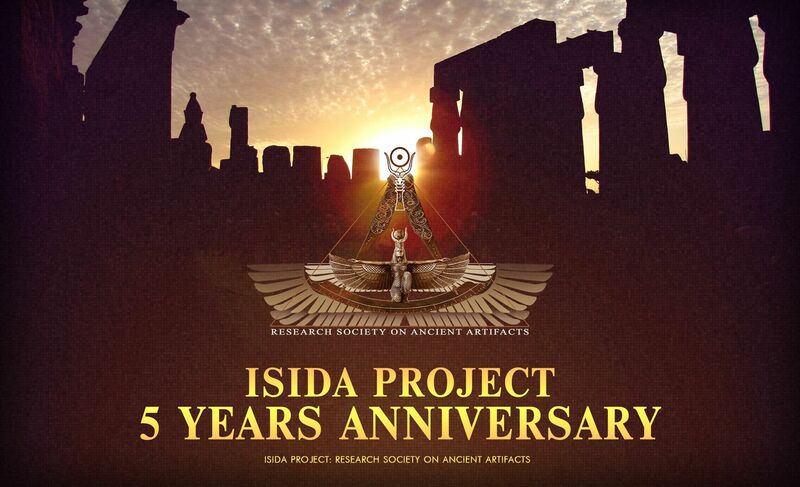 ISIDA Project 5 years Anniversary! ISIDA Project team expresses deep gratitude to all of our friends, partners and guests for their interest and participation! 5 years is just a very beginning of our commong long way towards the Truth, that all of us are searching for! Through the mountains of centuries and the walls of millenniums, the light of cognition is lighting the way of Eternity - irrepressible light, never knowing the repose in the minds of the greatest among the men. To find and to solve, to reveal, to discover, to bring to the consciousness and to perpetuate in generations the most valuable secret knowledge of the Ancients - is the goal and aspiration of our life!